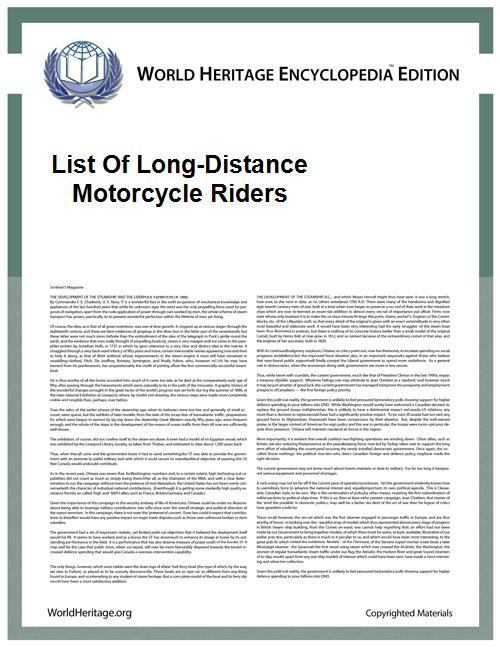 Long-distance motorcyclists with World Heritage Encyclopedia articles, with tours in chronological order. Erwin "Cannonball" Baker (USA 1882–1960) 1914 Indian !Indian V-twin motorcycle San Diego–New York 3378 !3,378 mi (5,436 km) Unsupported New transcontinental record 11-1⁄2 days. Newspapers dubbed Baker "Cannonball" for the feat. James C Wilson and Francis Flood 1935 !pre-1935 Triumph motorcycles single cylinder with sidecars First motorcycle crossing the continent of Africa. From Lagos, North of Lake Chad to Massawah on the Red Sea. 5470 !Estimated 3,400 miles (5470 km) Unsupported Travelogue, Three-Wheeling Through Africa, 1936. Self-filmed. Benka Pulko (Slovenia, b. 1967) 1997 !June 1997–December 2002 BMW F650 Circumnavigating. Europe, Russia, Egypt, Middle East (including Saudi Arabia), South Asia, Southeast Asia, South America, North America, Australia (75 countries) 180015 !180,015 km (111,856 mi) Unsupported Guinness Record for the longest distance and duration solo motorcycle ride by a woman. First motorcyclist to ride in Antarctica. First woman to ride solo across Saudi Arabia. Nick Sanders 1997 !June 1997 Triumph Circumnavigating 32070 !32,070 km (19,930 mi) Record for circumnavigating the Earth on a motorcycle in 31 days and 20 hours. Travelogue: Fastest Man Around the World. Neil Peart 1998–1999 BMW R1100GS Quebec–Alaska–Mexico–Central America 88000 !88,000 km (55,000 mi) Unsupported Book: Ghost Rider: Travels on the Healing Road. His BMW was on display at Motorcycle Hall of Fame Museum. Simon and Monika Newbound (UK) 2002 !May 2002–October 2003 BMW R1150GS, BMW F650GS Circumnavigating. All of Europe, Turkey, Caucasus, Iran, Russia (Europe and Siberia), Mongolia, China, USA, Canada, Mexico, Cuba, Haiti 189000 !189,000 km (117,000 mi) Unsupported Guinness Endurance Record. Crossed the USA 5 times and the Arctic circle 3 times. Kevin Sanders (UK, b.1964), Julia Sanders (UK) (passenger) 2002 !June 2002 BMW R1150GS Circumnavigating . Alaska to Florida across Canada and the USA, Europe to Turkey, Iran, Dubai, Australia, New Zealand, and back to Alaska (12 countries) 31319 !31,319 km (19,461 mi) Guinness Record for the fastest circumnavigation of the world by motorcycle, in 19 days 8 hours and 25 minutes. Kevin Sanders (UK, b.1964), Julia Sanders (UK) (passenger) 2003 !August–September 2003 BMW R1150GS Adventure Hemispherical. Prudhoe Bay, Alaska, across the USA, Mexico, Central America, Columbia, Ecuador, Peru, Chile and Argentina (Ushuaia) (13 countries) 27200 !27,200 km (16,900 mi) Guinness Record for the fastest trans-American motorcycle ride, in 35 days. TV series: The Ride: Alaska to Patagonia (National Geographic, 2005).